Indian convert to Christianity; born in Cochin 1795; died about 1855. He was converted in 1818 by T. Jarrett of Madras, and became the first missionary in India of the London Society for Promoting Christianity Among the Jews. In 1820 Sargon visited his parents at Cochin, who received him kindly; and for a time the Cochin Jews seemed to have no objection to discussing with him his new faith. This reception appeared to promise well for a conversionist propaganda in India; and a local committee of the London society was formed in Madras with Sargon as the representative missionary. Madras became the center of the society's work in Asia. By 1822 Sargon had 116 Jewish children under his charge at Cochin; but in 1824 he was transferred to Bombay, where he opened under the auspices of the London society a school exclusively for Jews, obtaining forty pupils. The result of his labors in Cochin was the baptism of one Jew and of two Jewesses in 1828; and shortly afterward the activity of the London society ceased in India. Sargon and his brother Abraham, however, continued their educational activity in Bombay, where for nearly thirty years they taught the Jewish children the tenets of Judaism without any attempt to convert them. 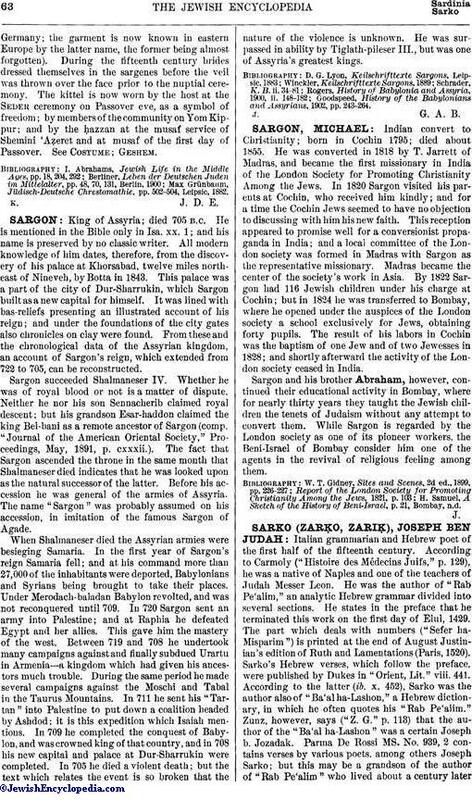 While Sargon is regarded by the London society as one of its pioneer workers, the Beni-Israel of Bombay consider him one of the agents in the revival of religious feeling among them. H. Samuel, A Sketch of the History of Beni-Israel, p. 21, Bombay, n.d.